In 2005, from the developers of the Ice-Pick Lodge studio, a PC game called Pathologic was released, in the original its name was Мор Утопия (Mor Utopia). Action-adventure game, in which the world of surrealist horror accompanies the protagonist in the fight against the strange plague, that destroys the unnamed city. Ten years later, we find Pathologic Classic HD – the same game, but with fixed bugs, new translation and refreshed textures. In the meantime, in September 2014, a campaign is launched on Kickstarter, the aim of which is to fund Pathologic 2 on a PC, XBOX One and PS4. 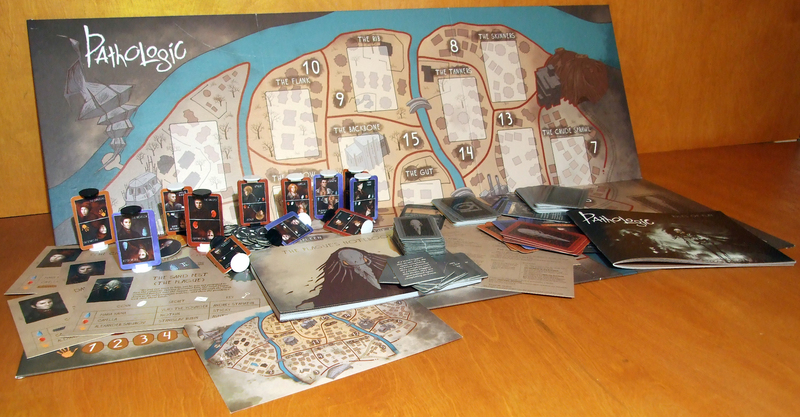 This is where the board game appears for the first time, as a reward project for backers. The team composed of Liu Sukhinina, Fuad Kuliev, Elena Vishina and Andrey Salik forming the CapsLock Games are in full swing working on adapting the video game to the board. 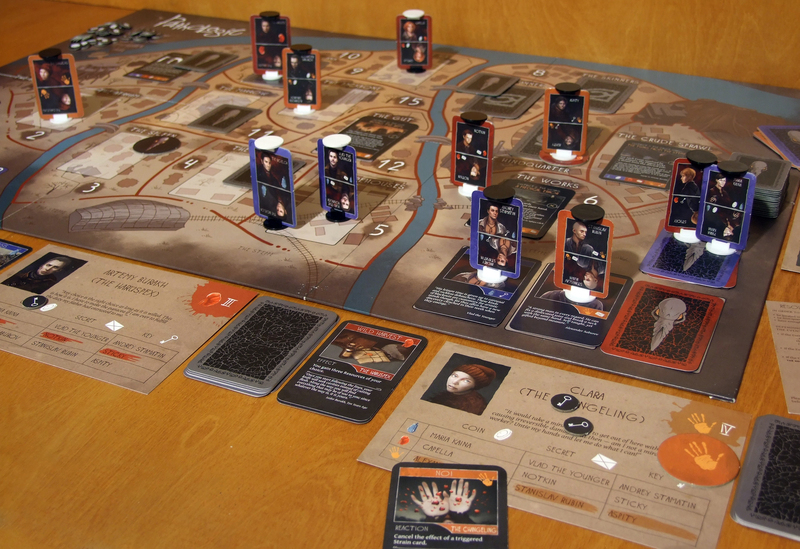 The result of their work emerged in 2016, and from that moment the game is available for pledging the campaign, or you can buy it on its own website. 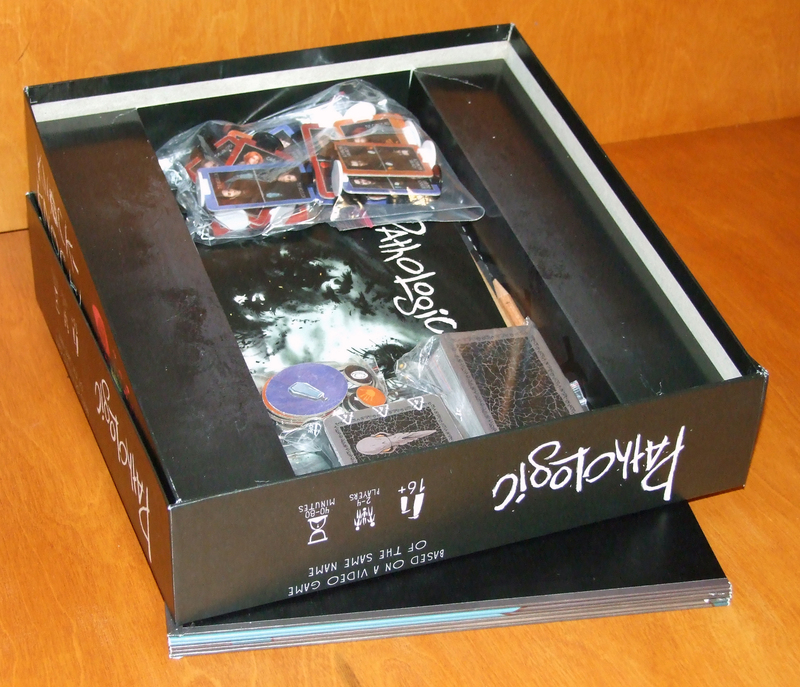 The climatically illustrated box is of a standard size. 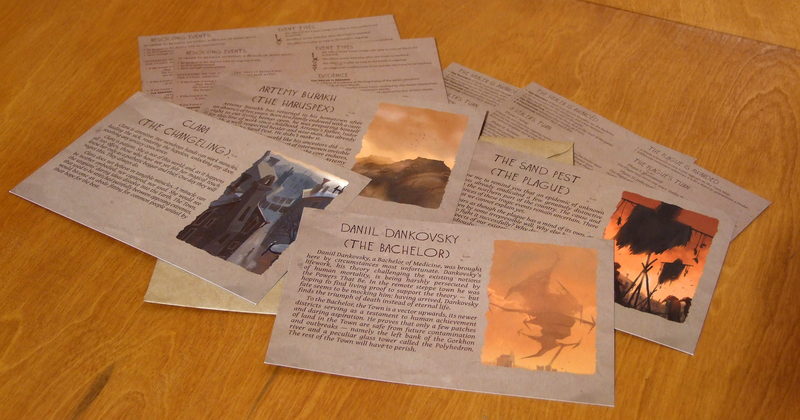 Inside, you will find 54 smooth and stiff, event, prescriptions and obituaries cards, 4 quick reference and 4 hero sheets for players. 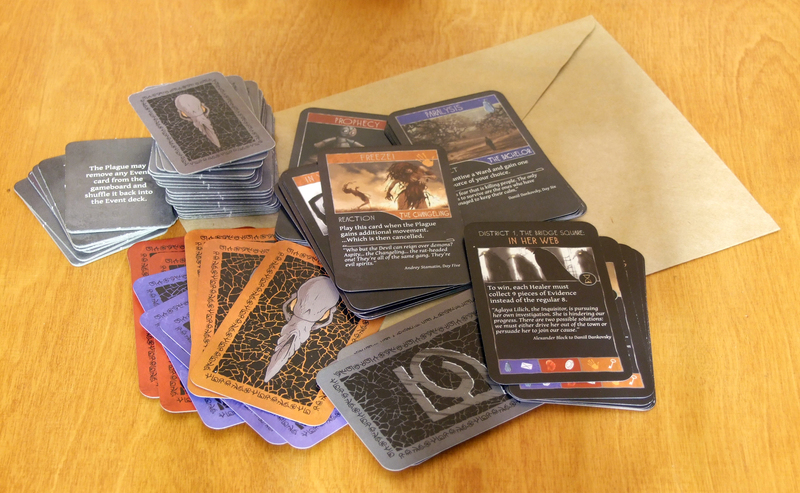 The next components are made of coated thick cardboard, among them are 24 strain tiles, 12 character standees, stack of resource tokens, victory points markers, pacts and blockade token. 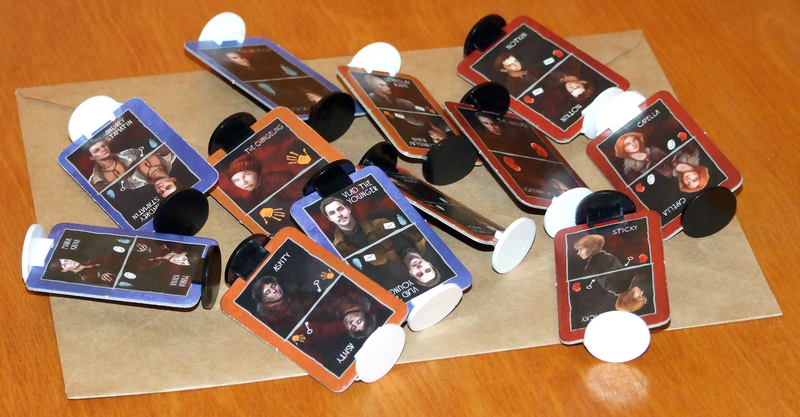 Each character standee will be placed in a set of two plastic stands – black and white. Finally, we have an A5 size notebook to track the movement of the plague and a large 90 cm x 60 cm board illustrated with the city map. 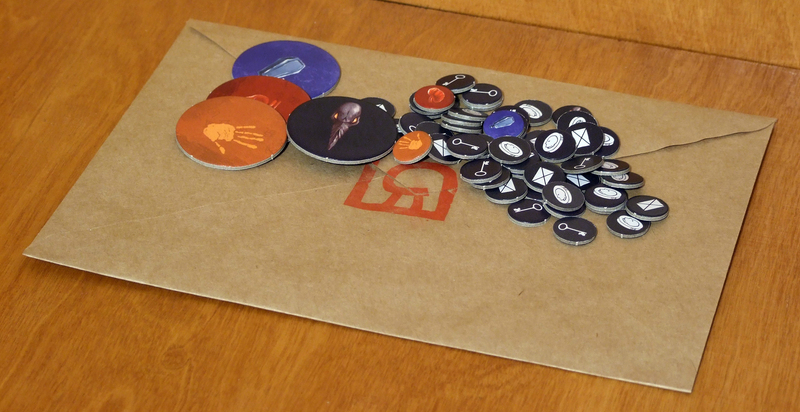 Elements of this game are durable and solidly made, they make an impression of rigid and heavy. It’s a sum of several things, the choice of material, texture, general colors and anxiety inducing illustrations. The whole project is very consistent and reflects the atmosphere of the game that captivated me. Unfortunately, it wasn’t spared some mistakes, one of the key words defining one of the three types of prescription cards was replaced during translation of the rulebook with another. It’s not a problem that affects the game, provided consistent use of the word, you only need to remember about this change when describing the rules to someone. As for the rulebook itself, it is clear, but through a very technical selection of words it can be quite unpleasant to read. Another small slip are the names of districts in Russian on the minimap of the plague notebook, fortunately publisher adds a separate translated map to each game copy, and the districts themselves are also have assigned numerical values to them ​​beside their names. Additional “component” outside of the box, that will create the atmosphere is background music, which the publisher has made available on the game web page, which we can imbibe while playing, of course, apart from it, we can also use the phenomenal music from the PC version, whose authors are Andriesh Gandrabur and Vassiliy Kashnikov. In the game, we can play as one of the three protagonists, who want to prove that their theory of how to get rid of the plague is the best, or become the plague – the destructive power dominating the city. It is our battleground, surrounded by a steppe, a dark, claustrophobic, stifling city in the style of those from the late nineteenth century. In the area of the spreading plague, an Inquisitor arrives, who will decide what the future of the city will be. Among the characters, which we will be impersonating, we find Daniil Dankovski – a licensed researcher exploring the secrets of tanatology, brought to the city by one of the officials. The next figure is Artemy Burakh – son of a local philosopher-shaman, returning after 10 years of study on modern medicine, combining surgery with the art of interpreting omens from the bowels, practiced in ancient Rome, known as haruspicy. The last positive hero is Clara, a girl out of nowhere, a changeling ,who, according to rumors, was found at the bottom of a freshly dug grave. A character, who bases her ways of acting on strange visions and alleged miraculous skills. Each of these people has their supporters in the city, wanting to end the reign of the plague, and must protect them, because they are vital for their victory. The antagonist, against whom we stand, is the Sand Plague that’s ravaging city, also called by local people the Sand Pest or Sand Ulcers. An undetermined embodiment of evil, which in a strangely coordinated way kills adherents important for the protagonists. During the game, we will wander around the city, trying to solve events alone, or by delegating it to one of the supporters, events will appear in specific districts. To solve it, we will be forced to cooperate with the others, sneaking from place to place in fear of the plague attack. Sand Pest, however, a prowling hunter, will need to kill three specific adherents, to prevent us from proving our reasons and therefore winning. I was skeptical about the semi-cooperative mechanics where the players cooperate so as not to lose, but only one of them can definitely win. Often, games of this type tend to have a defect, in the form of the “if I can’t win, no one will” attitude. Adding an opponent with an asymmetric victory condition was a way to handle this, but on the other hand, it generated another problem in the form of “king-making”. When one of the “positive” heroes is indifferent to which of them will win – the player playing the plague has practically no chance of winning. Therefore, I would like to emphasize that this game in the 3 and 4 player variant is very much depending on the players, assuming that everyone will try his best to win it until the very end. This problem, however, completely disappears when we play one on one. The winning condition for victory of the plague is to slaughter 3 adherents randomly chosen at the beginning of the game, one from the group of each hero. Until now, I’ve encountered games in which, playing with hidden movement on the board, the player was an escape artist, using some tricks for hunters looking for him. 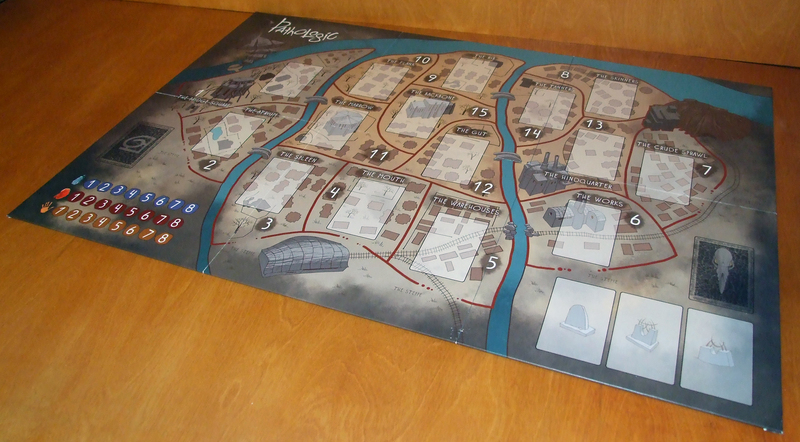 In Pathologic, the roles are reversed, the Plague is trying to chase the heroes and their supporters on the board, additionally leaving strain tiles here and there. Each murdered supporter is a negative victory point for a given hero. The motive of retracting points, staining the map with mines, combined with spreading paranoia among the players about who are the actual plague goals and where the disease will attack now, is amazing and I love it. 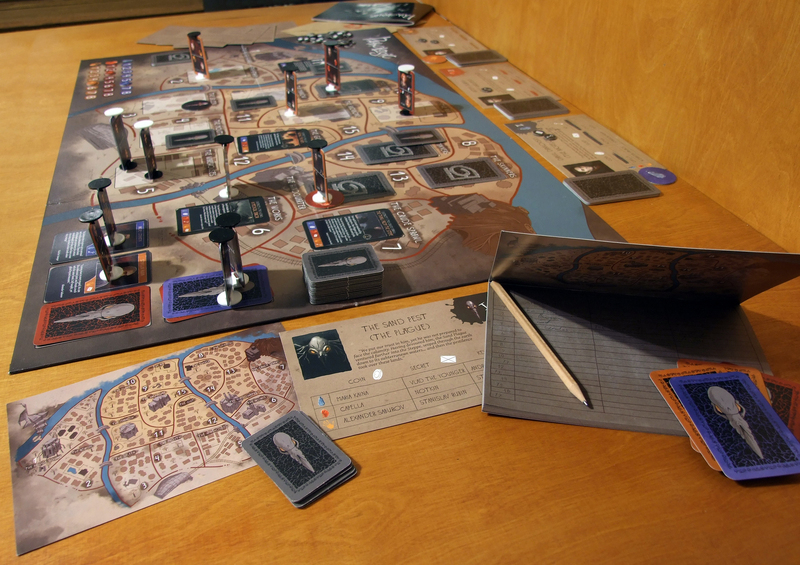 Hidden movement in board games, usually brings to them an element of a long-lasting turn of the hiding player, because he must carefully cover the route of escape and often watch some of the mechanics that are secret to the others. In this case, thanks to the specificity of being a hunter and not a runner, the plague has only move as a totally hidden mechanic. A direct attack will reveal its current position, and leaving a strain will reveal several likely places of her stay. This few things he needs to watch, efficiently speed up the turn and immunize the game to the probable mistakes done by the hidden player. I consider the combination of these mechanics with this story a great idea – sensitive in case of king making, but very well executed. The key to winning, regardless of whom we play, is caution, deduction on what who wants and planning on how to use this knowledge. One game can last about 45 minutes. If you are a player who likes to give up on winning in the middle of the game – this is not a game for you, you will quickly get bored and you will spoil the fun for others. If you’re a fan of Мор Утопия on PC, then you just have to have this game. 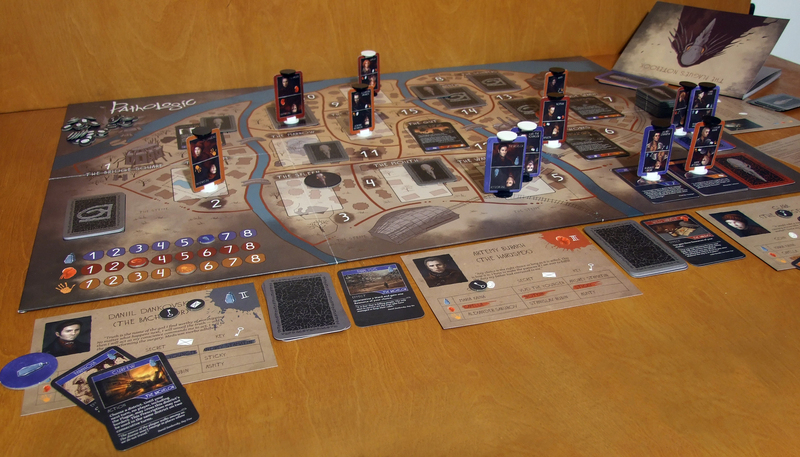 If you don’t give up until the very end of the game, you like to scratch your brain and you are looking for some innovation in the mechanics implemented here – you should definitely take a look at Tabletop Pathologic. I sat down to this title completely without knowing the video game and after reading the rules and playing the first game, I was dying of curiosity of the plot by Nikolai Dybowski, after delving into Pathologic Classic HD I find it amazing. Adaptation of this story to the board game has drawn me completely. The first edition did not avoid a few mistakes from the production standpoint, but I know that the second edition is underway and I strongly encourage you to follow its further developments. I will be always happy to play this one and never turn down a game If someone suggests to play it. This board game will never leave my collection.